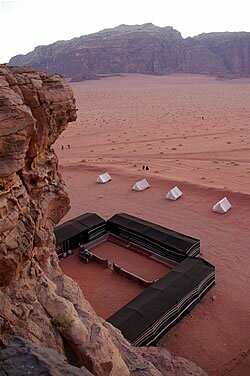 Wadi Rum Full Moon Camp is located in the Wadi Rum protected area, 7 km from Rum village and 15 Km from the Wadi Rum Visitor's Center. The camp is close to the spectacular Small Rock Bridge and the famous Khazali canyon. 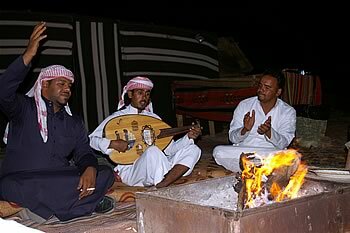 It is a traditional Bedouin campsite which can accommodate up to 30 person. Our campsite is at the very foot of the Umrashed mountain, which is perfect to climb and enjoy the sunset in the desert with the best panorama of Wadi Rum. 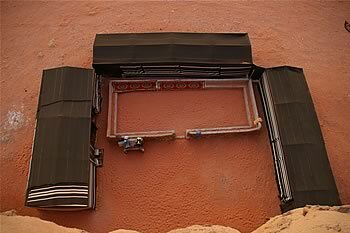 It is a very peaceful and secluded place, allowing you to experience the silence and the magic of the desert. At night you won't be disturbed by any light other than that of the moon and stars. There is a main tent with 2 large separate rooms, one for the fireplace and dinner and the other one for the special meetings, and smaller private rooms for sleeping. There are also few smaller separate tents, each of which for two people. Most people choose to sleep under the stars or within the large tents, but we offer these smaller tents if you wish to have more privacy. There are also tents for families, enough for up to 5 people. We have a nice outside sitting area with comfortable seats and fireplace in the middle for the warm nights when you can enjoy the stars and the moon. In the camp we have showers & toilets. There is a kitchen to prepare our traditional Bedouin food (mansaf, zarb, kapsah, magloobah). All the tents are equipped with everything needed for a comfortable night in the desert: mattresses, blankets, pillows and candles, so that there's no need to have a sleeping bag. *Please contact us directly if you are a big group or if you want to book the whole camp for the private functioning.